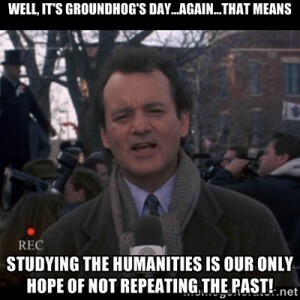 It’s a tradition in our house to watch Bill Murray’s 1993 film “Groundhog Day” every February 2. As a great deal of Nebraska got hit by a blizzard today – just as Bill Murray’s character did in the movie – it’s an especially fun day to watch it this year. If you’ve never seen the movie (and you should! ), Murray plays Phil Connors, a bitter, egocentric weatherman who somehow gets stuck living February 2 over and over again. He responds first with confusion, then anger, self-indulgence, and depression by turns. Eventually, Phil undergoes a personality transformation, and this is where the humanities come into play. He reads great literature. He learns to play the piano. He teaches himself French. He sculpts ice into beautiful art. He becomes interested in other human beings, learning their life stories and eventually developing the empathy to make a difference in their lives. That’s what the humanities can do for all of us. By studying culture, art, literature, languages, history, and other humanities, we learn to understand other humans. That makes us better people, and that can make the world a better place.